If you read The Squaw Campaign, you will recall that General Washington sent General Edward Hand to Fort Pitt to organize the “Western Department” to defend against the British headquartered at Fort Detroit and against their Indian allies who were waging terrorist warfare against the families of the men from Virginia and Pennsylvania who were back east serving in the Continental Army. General Hand arrived at Fort Pitt on June 1, 1777. In December 1777, Hand wrote a letter to Washington describing the undisciplined nature of the militiamen and asking to be reassigned to the regular army back east. He was referring to Westmoreland County, Pa., and Ohio County, Va., militias. The volunteer militiamen were very independent and only followed orders as they pleased. As a result, Hand had difficulty forming them into an army that could function as a single unit. Hand found the behavior of the militiamen during the Squaw Campaign to be uncivilized. In May of 1778, Hand sent another letter to General Washington and to the Continental Congress repeating his request to be relieved of command of the Western Division and reassigned back east. Around the same time, Washington transferred the 8th Pennsylvania and 13th Virginia regiments to Fort Pitt to strengthen the Western Division. You may recall that Captain Matthew Brady and Captain Van Swearingen both served in the 8th Pennsylvania, and Lieutenant Benjamin Biggs served in the 13th Virginia. 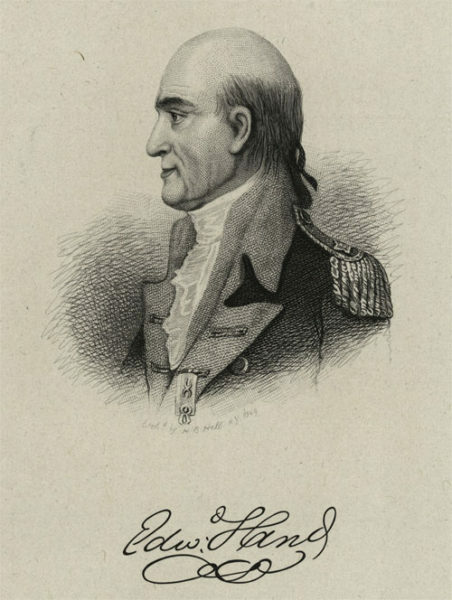 In August 1778, General Lathan McIntosh replaced General Hand as commander of the Western Department including Fort Pitt. Shortly after McIntosh assumed command at Fort Pitt, Chief White Eyes of the Lenape (Delaware) Indians contacted him and asked for a meeting between the Delaware Chiefs and the Americans to work out a peace treaty between the Lenapes and the Americans so that the Delawares could stay out of the conflict between the Americans and the British. McIntosh invited the Delaware chiefs to Fort Pitt to work out the details of the treaty. On September 17, 1778, Chief White Eyes of the Turkey Clan, Chief Pipe (Hopocan) of the Wolf Clan, and Chief John Kill Buck (Gelelemend) of the Turtle Clan signed the Treaty of Fort Pitt (full text of the treaty) on behalf of the Lenape (Delaware) Indians. Andrew Lewis and Thomas Lewis signed the treaty on behalf of the Americans with Brigadier General Lachlan McIntosh, Colonel Daniel Broadhead and Colonel William Crawford signing as witnesses. The treaty recognized the Lenape (Delaware) Indians as a sovereign nation and granted them a representative in the Continental Congress. The Lenape promised to remain neutral during the conflict between the British and the Americans and to supply provisions and other support to the Americans when they could. They also granted permission for the Americans to travel through their lands and to build a fort in the Ohio country for their protection. In exchange, the Americans promised to protect the Delawares from harm and to provide them with firearms, tools, clothing, and cooking utensils. The Americans began violating the treaty less than a year after it was signed. After signing the peace treaty with the Delawares, McIntosh took a small army north along the Ohio River. 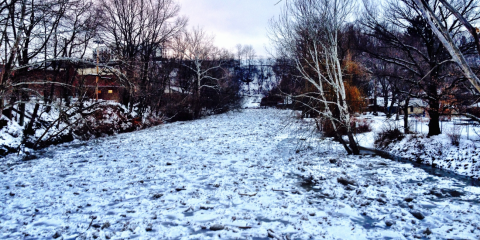 In October 1778, they reached the confluence of the Beaver River where it emptied into the Ohio. 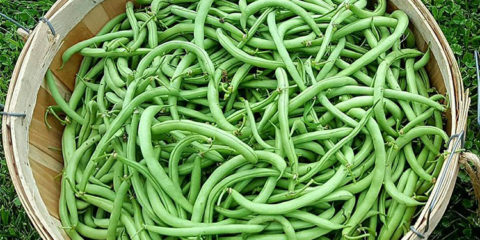 There, they built a fort that McIntosh named after himself. Historical marker at the site of Fort McIntosh along the Ohio River just west of the confluence of the Beaver River in modern-day Beaver, Pa.
After completing Fort McIntosh, the expedition continued west until they reached the Tuscarawas River at a site just south of the modern-day town of Bolivar, Ohio. There, they constructed another fort that they named Fort Laurens in honor of the President of the Continental Congress, Henry Laurens. McIntosh envisioned Fort Laurens as a base from which the Western Division could launch an attack on the British at Fort Pitt and on their Indian Allies on the Sandusky River. They completed the construction of Fort Laurens in early December 1778. 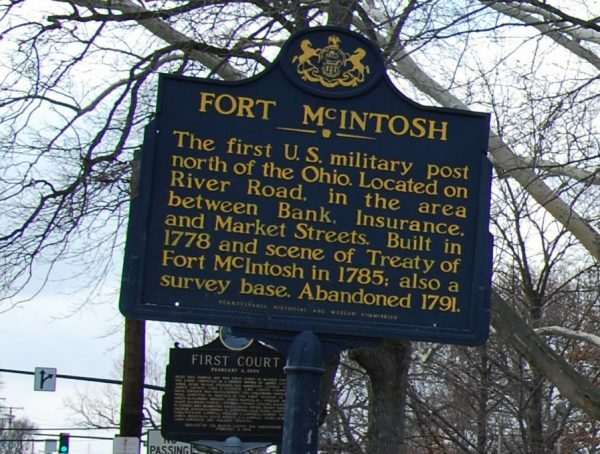 McIntosh left a small contingent of men to defend the fort and then returned to Fort McIntosh and then to Fort Pitt. Informational Sign at the Fort Laurens State Memorial just south of Bolivar, Ohio. Encouraged by Simon Girty and Alexander McGee, the Wyandots and other Indians attacked the poorly defended fort almost immediately. During February 1779, Simon Girty and a small army of Indians began a siege of Fort Laurens. The Defenders consisted largely of men from the 8th Pennsylvania and 13th Virginia regiments of the Continental Army. By the time the siege was lifted in late March, starvation had forced the defenders to resort to grubbing for roots and boiling rawhide moccasins to make soup. In August 1779, the Americans abandoned Fort Laurens. During the attacks on the fort, 20 of the defenders were killed. They were buried in a small cemetery near the fort. In 1772, the Moravian missionary, the Rev. David Zeisberger, accompanied by his assistant, John Heckewelder, their Christian Indian followers, and several other white helpers, moved from near Bethlehem, Pa., to the Tuscarawas River region in northeastern Ohio where they built the towns of Schoenbrunn and Gnaddenhutten. When the war between the colonies and the British broke out, Chief White Eyes of the Delawares suggested that the Christian Indians should move to a location near the main Delaware town of Goschachgunk (Joining of the Rivers) so that he could protect them from harm because most of the Moravian Christian Indians were Delawares. The name of the town of Goschachgunk was later changed to Coshocton which evolved into present-day city by the same name. 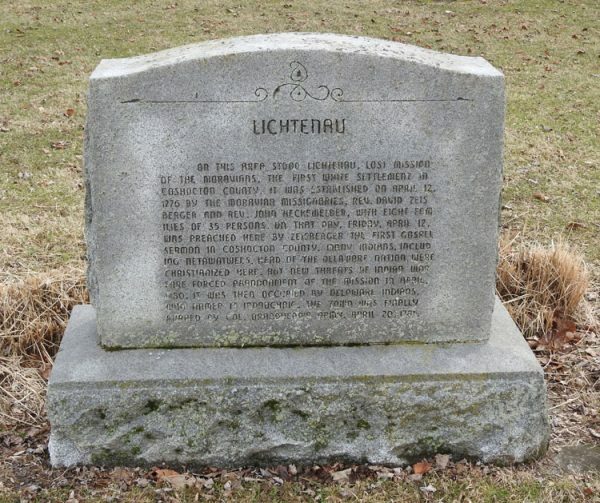 In the spring of 1776, Zeisberger, accompanied by Heckewelder and eight of the Christian Indian families moved to a site less than a mile south of Goschachgunk (Coshocton) where they built a small town that they called Lichtenau which meant “Pasture of Light.” (Many historical accounts put the establishment of Lichtenau at October of 1777, but the historical marker at the site lists the date as April 12, 1776.) The missionaries and their followers continued to live at Lichtenau until 1780. In spite of the Treaty of Fort Pitt, the Delaware nation became more and more divided as the war between the Americans and the British dragged on. By 1780, some of the Delawares had joined the Wyandots and others in supporting the British. Some of the Delawares supported the Americans, but most of them tried to remain neutral. In the spring of 1780, the Moravian missionaries and their followers decided to abandon Lichtenau and return to their old homes at Gnaddenhutten and Schoenbrunn. As they headed upriver, Heckewelder and several of the Indian families decided to stop about six miles south of Gnaddenhutten and build a new settlement that they called “Salem” (Peace). A handful of the Christian Indians remained at Lichtenau and the remainder continued to Gnaddenhutten and Schoenbrunn. They remained at Schoenbrunn, Salem and Gnaddenhutten until 1781 when they were forcibly moved northwest to a new site on the Sandusky River. 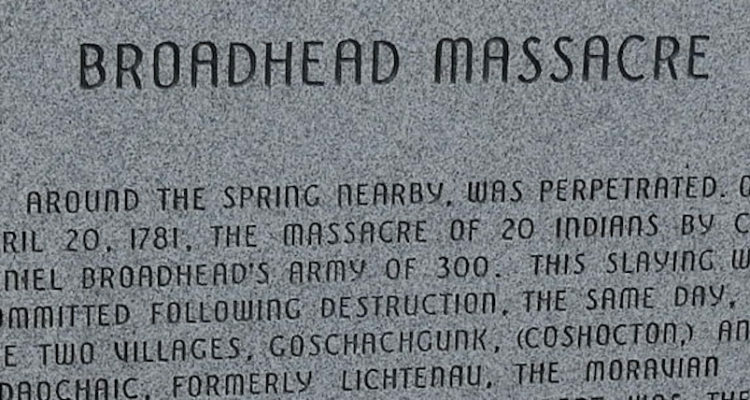 The other major Delaware Indian town was Gekelmukpechunk, which was located on the Tuscarawas River about 15 miles east of Goschachgunk (Coshocton). Netawatwes, chief of the turtle clan, lived there and his name translated as “The Newcomer.” As a result, the town became more widely known, among the white settlers, as “Newcomer’s Town. Today, it is Newcomerstown, Ohio. 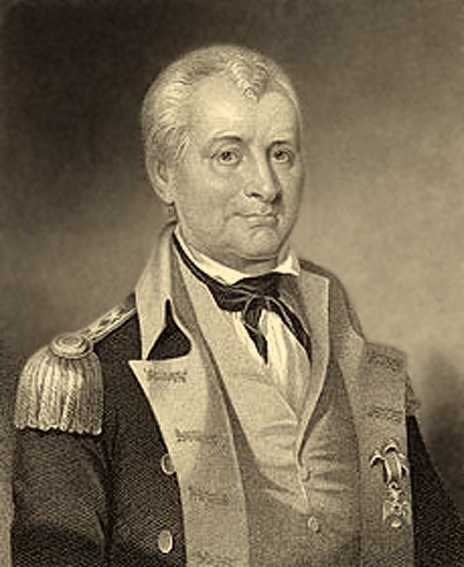 On March 5, 1779, Lieutenant Colonel Daniel Broadhead replaced McIntosh as Commander of the Western Department. 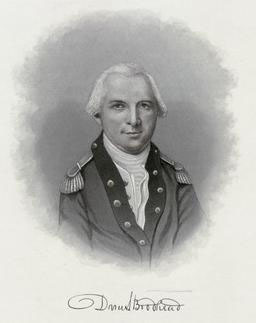 Broadhead commanded the Western Department until May of 1781. During his tenure as commander of the Western Division, Broadhead made several excursions into Indian country. One of the last of those was in April of 1781 only a month before he was relieved of the command. On April 7, 1781, Colonel Broadhead accompanied by 150 regulars from the 8th Pennsylvania and 13th Virginia, and 134 militiamen, from the Westmoreland County, Pa., and the Ohio County, Va., militias, headed out along the Ohio River. Aware that some of the Delaware Indians of the Turtle and Wolf Clans had started supporting the British, Broadhead’s purpose was to meet with the Delaware tribal leaders to reinforce the alliance with them created by the 1778 Treaty of Fort Pitt. Believing that Broadhead’s motive was to reinforce the peace with the Delawares, Chief Gelelemend (AKA Chief John Killbuck) of the Delaware Turtle Clan served as a guide for the expedition. 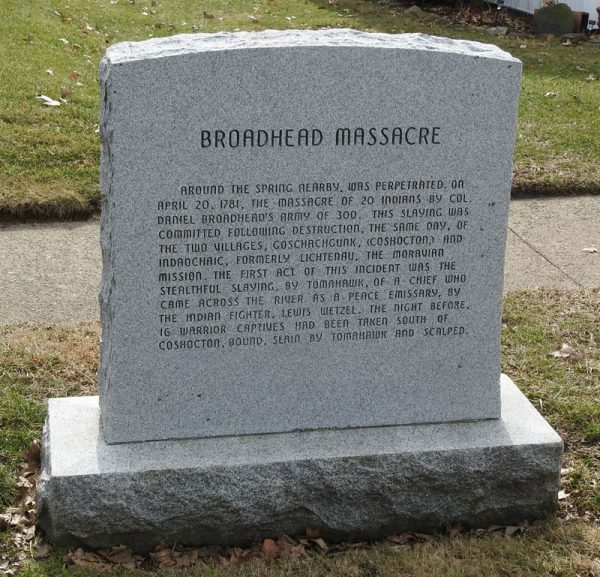 On April 18 or 19, 1781, Broadhead’s army reached an area a few miles from the peaceful Delaware town of Gekelmukpechunk, (Newcomerstown), on the Tuscarawas River 15 miles east of Coshocton. Broadhead sent a messenger to the Delaware chiefs asking them to come to a meeting on the east side of the Tuscarawas River to arrange for a peaceful solution for his concerns. In response, some of the Delaware chiefs came out for a meeting with Broadhead. As soon as the Delaware delegation crossed the river on their way to Broadhead’s encampment, Lewis Wetzel ambushed them killing one of the chiefs with a tomahawk. After the destruction of their towns by Broadhead’s expedition, Chief Pipe and most of the remaining Delaware Indians left the Muskingum and Tuscarawas River regions and moved to northwestern Ohio where they built a new home on the Sandusky River about 10 or 15 miles north of Half King’s Wyandot town. The new home of the Delawares became known as “Pipe’s Town.” As a result of Broadhead’s action, Chief Pipe and the Delawares became firm supporters of the British for the remainder of the war. The Moravian Christian Indians stayed at their homes in Salem, Gnaddenhutten and Schoenbrunn until they were forcibly moved to the Sandusky River region in the fall of 1781. 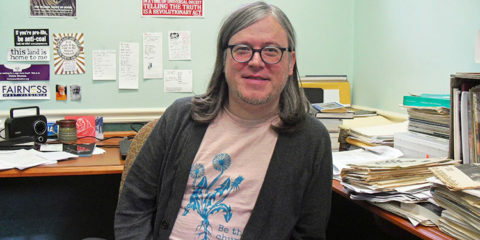 The next installment in this series will discuss the forced relocation of the Moravian Indians and the 1782 event known as the Moravian Massacre. Each of the following sets of GPS coordinates will take you to a historic marker or historic site related to one of the locations where events described in the above story took place. If you are unable to travel to those locations and visit them in person, copy the coordinates and paste them into the search box on Google Earth. Then, use the Google Street View to take a look at the location. Have Fun! A small park along the river commemorates the location of Fort McIntosh. It features several historical markers. Coordinates: N 40° 38′ 21.9″ W 81° 27′ 20.6″ A small park also commemorates the location of Fort Laurens. If you visit the site in person, be sure to take a walk along the Ohio and Erie Canal which passes through the site of the fort. 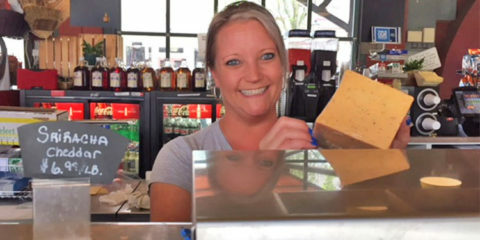 This is a great place to go with your children. There is no historical marker commemorating Newcomerstown as a Delaware Indian village. The coordinates listed will take you to the middle of the Rte. 258 bridge over the Tuscarawas River at Newcomerstown, Ohio. This is on a residential street in Coshocton. This is on Rte. 36 out in the country. If you visit in person, you will find a nice turnout where you can stop for a photograph. Here are some of the sources of information for this story if you would like to do more reading. Some of these materials are available as free downloads from https://archive.org/. Video: Fort Henry Commemoration Speaker Series: Who Attacked Fort Henry and Why? Available on Vimeo.Com at This Link. Publisher Newark, Ohio, A. A. Graham & Co. Publisher Hamilton, Ohio: Republican Pub. Co. In the 4th paragraph, you say that McIntosh built Fort Laurens as a base to attack the British at Fort Pitt. Didn’t he Americans control Fort Pitt at that time?